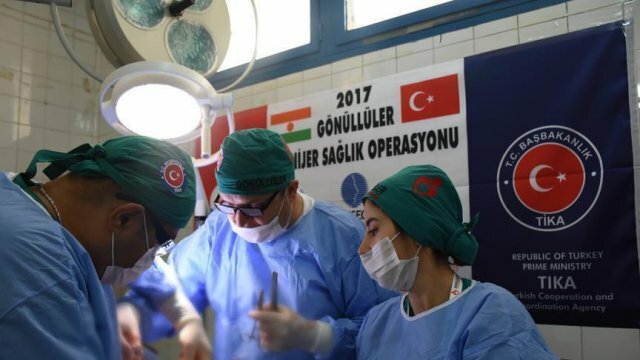 A team of Turkish doctors in Niger have performed hundreds of cataract surgeries and provided thousands of clinical consultations in only 12 days. Istanbul-based University of Sanitary Sciences (SDU) in collaboration with Gonulluler Hareketi (Volunteer Movement) began a project in the poverty-stricken West African country. In a statement issued on Monday, the university said a team of six doctors and seven nurses led by Dr. Selim Genc performed the surgeries in Tessaoua and Aguie cities in Niger's Maradi region. In 12 days the team performed 725 cataract surgeries and made 2,728 clinical consultations free of cost, according to the statement. "We are working to return the eyesight of people who live 720 kilometers (447.38 miles) away from the capital Niamey," said Prof. Hasan Huseyin Eker, director of the university's Africa Research Center. "Our university is the continuity of the establishment created in 1903 by the then Ottoman Sultan Abdulhamid II to train health professionals in the Islamic world. We will continue this mission with the same determination as in 1903," he added.